Salmonella (paratyphoid), E-Coli and bacterial infections. starting the day after the race. As a treatment: 1 measuring spoon (=5g) for 2 litres drinking water during 5-7 successive days. This cure may be repeated if necessary after a few days. Stir well before use! 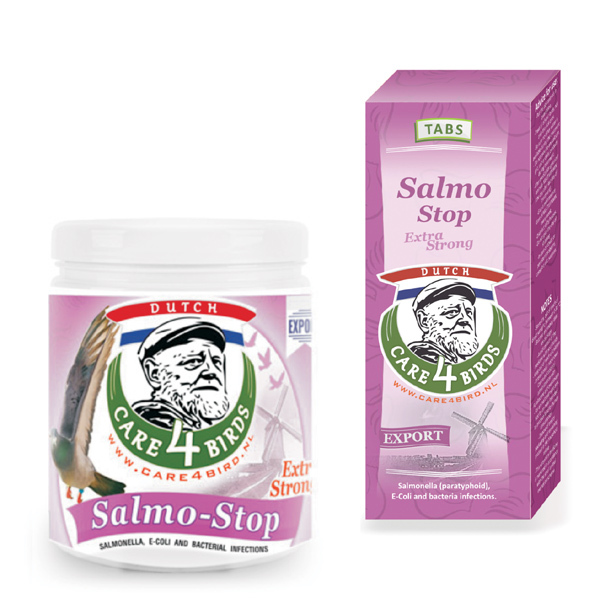 Salmo Stop is a water-soluble powder which can also be given under the feed. Measuring spoon 1+5 g included. Preventive: 1 tablet per pigeon ( 400-500 g bodyweight) for 1-2 consecutive days. Curative: 1 tablet per pigeon ( 400-500 g bodyweight) for 3-5 consecutive days, or as Vet. prescribes.